Spread product efficiently and effectively with Scotts Turf Builder EdgeGuard Mini Broadcast Spreader. Equipped with Scotts exclusive EdgeGuard Technology, you can trust that the product you spread will be spread accurately. You can even control the panel’s precision rate setting to deliver more accurate coverage on up to 5,000 sq. ft. 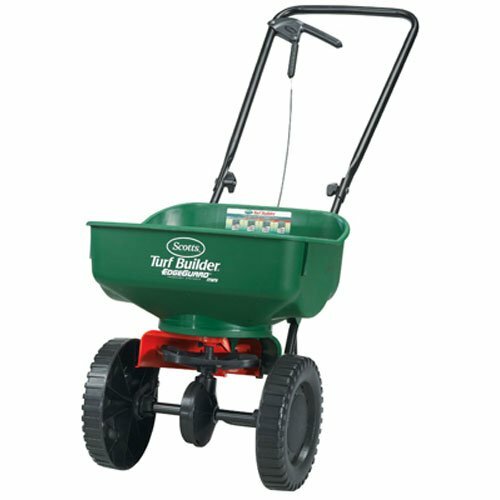 The Scotts Turf Builder EdgeGuard Mini Spreader comes calibrated and ready to use, so you can get started right away. View More In De-Icers & Salt Spreaders.